A report by enterprise device management company Jamf found that more companies are allowing their employees to choose their own computers and mobile devices than ever before —and the majority of them are choosing Macs, iPads and iPhones. 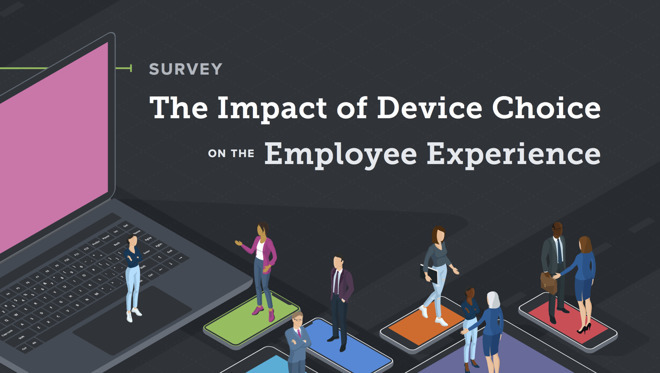 According to The Impact of Device Choice on the Employee Experienceby Jamf, the ability to choose their own devices is very important to employees. Jamf surveyed 580 enterprise organizations worldwide, querying executives, managers and IT professionals. Jamf found that when it comes to computers, 52 percent of enterprise organizations now allow their employees to which type of computer to use at work. But of those that can, 72 percent choose Macs while 28 percent pick PCs. It was a similar story for smartphones. Jamf's survey found that 49 percent of organizations allow employees to choose their own smartphone, but for those who can, 75 percent chose Apple or Android, while "less than a percent" chose BlackBerry. However, the survey found that only 25 percent of respondents want to BYOD (Bring Your Own Device), and prefer a company-issued device of their own choosing. This is mostly because users "want to keep their business and personal life separate." As Jamf works primarily with Apple products, there is a chance the survey is skewed towards Apple users, although its methodology merely states that the survey was "based on the responses from 580 executives, managers, and IT professionals from small, medium, and large organizations around the world." Jamf concluded that allowing users to choose their own devices is important to employee morale and motivation. "When it comes to attracting and retaining top talent in the enterprise, the job landscape is more competitive than ever," Dean Hager, CEO of Jamf, said as part of the release of the survey. "With the highest global talent shortage in 10 years, it's no wonder that a major priority for enterprise organizations is to create the ultimate employee experience. When employers combine the freedom of technology choice with Apple, the results are stronger employee retention, productivity and job satisfaction." Jamf said in January that it now manages 9 million Apple devices.